Based on the executed measurements the needed calculations could be carried out and the distance between the Kittisvaara fell and the belfry of the Tornio church could be counted. In the angular measurements the angle between Kittisvaara and Tornio was set on 5727 which is very close to one degree. 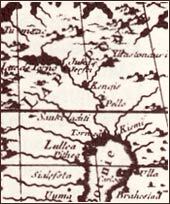 The distance between Kittisvaara and Tornio was calculated by the use of triangular measurements. In the final measurements nine triangles out of the triangular chain were used. The result had to be adjusted because Tornio and Kittisvaara did not lie exactly on the same meridian. After the revision measurements the length of one degree was defined as 57 437 toise (= fathoms). This is 111,95 kilometres. The measurements in Peru showed a length of 56737 fathoms for a meridian arch of one degree. The corresponding figure measured in the Tornionlaakso Valley was according to de Maupertuis 57438 fathoms. With this calculation the ratio of the flattening of the earth is 1:205 and the radius of the earth is 6398 kilometres.